It’s little surprise that the John Rylands Library won the Manchester Large Visitor Attraction of the Year title at the city’s latest annual tourism awards. This is, after all, not just one of the most visited and loved local buildings but one of the world’s greatest libraries. It was created at the end of the 19th century out of the bequest left by John Rylands, Manchester’s richest 19th century cotton magnate, by his widow, Enriqueta. The vast catalogue includes Dickens’s novels in their original wrappers; a first edition of Shakespeare’s Sonnets; the second largest collection of works by the pioneering printer William Caxton; and the personal papers of John Wesley, John Dalton and Elizabeth Gaskell. Although entry is free and much pleasure can be gained ambling around its corridors and crevices, only a guided tour can reveal the John Rylands Library’s true qualities. In the Reading Room, a glorious, galleried cathedral-like space, are two lines of statues on each side wall, complemented by a number of figures on the end walls. This is a unsurpassable collection of major cultural, scientific and historic figures that includes William Shakespeare, John Dalton, William Caxton, Francis Bacon, John Wesley and John Wycliffe. It is overwhelming and impressive. The positioning of these statues is not random. There is a logic running through the arrangement. At the river end, near the marble statue of John Rylands himself, Johannes Gutenberg and William Caxton face each other. Gutenberg, a German goldsmith, invented printing in Strasbourg in 1440 with mass-produced movable type. Each individual piece of metal could now be assembled into a “forme” to make a page and these forms inked and pressed onto paper. From now on the word and its power would no longer be confined to priests who had zealously coveted books, their contents and their knowledge. In England this revolutionary system was pioneered by William Caxton who set up a press in the shadow of Westminster Abbey in 1476 and soon produced Chaucer’s Canterbury Tales. 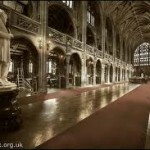 The John Rylands Library has first and second editions of the Caxton-published Canterbury Tales. Casting eyes over the length of the John Rylands Reading Room, near Gutenberg and Caxton, stand two of the great religious figures in English history, John Wycliffe and William Tyndale. Their story centres around the problem each faced with publishing, in their case publishing the most important book of all – the Bible. Wycliffe, a 14th century theologian, was special religious adviser to King Edward III, a monarch central to Manchester’s story for introducing to the area cloth workers whose skills could aide the local economy, and whose statue adorns the Princess Street side of the Town Hall. In the 1370s, at the height of his powers, Wycliffe renounced corruption within the Church and advocated that priests roamed the country preaching barefoot the simple message of Jesus. More worryingly for the establishment, he began promoting the idea of the Bible being translated into vernacular English. This was a revolutionary move as it threatened to break the stranglehold priests had over the New Testament, then only available in Latin, which few outside their closed circle could understand. He was charged with heresy and brought to trial at St Paul’s Cathedral (as depicted by Ford Madox Brown in the fifth of the Manchester Town Hall Murals). The trial broke up precipitately amid much wrangling and was reconvened five years later at Blackfriars, London. There, proceedings were rudely interrupted by an earthquake. Wycliffe, understandably, claimed the event as a sign of God’s discontent with the council’s hostile attitude to his reformist teachings. The council, with equal confidence, took the quake as proof of the Lord’s displeasure with Wycliffe. 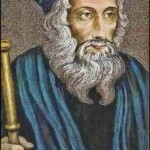 Wycliffe died in 1384 but his death did not bring an end to the drama. In 1427 the Pope ordered that Wycliffe’s body be “dug up and cast out of consecrated ground”. The corpse was exhumed from its grave in Lutterworth and burned, the ashes cast into the nearby River Swift. Supporters later mused on how the Swift by flowing into the Avon, the Avon into the Severn, the Severn into the Bristol Channel, and the Bristol Channel into Atlantic the whole world was soon being washed with Wycliffe’s remains. William Tyndale took things further. His period was the early 16th century under the reign of Henry VIII. 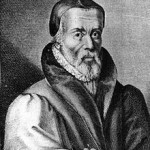 Taking advantage of Gutenberg’s and Caxton’s printing process, Tyndale became the first scholar to publish, rather than merely translate the Bible into English. Thomas More, Henry VIII’s chancellor, denounced Tyndale as a “beast” and a “hell-hound in the kennel of the devil”. In May 1524 the translator left for Germany where he arranged with a Cologne printer to publish the New Testament in English. Cardinal Wolsey, Henry VIII’s leading minister, hunted down Tyndale’s “heretical” translations. In London Bishop Tunstall burned several copies outside St Paul’s. Ironically Tyndale’s best customers were the king’s men who bought up every available copy just so they could burn them. Tyndale used the money to print even more. Why do these statues stand so prominently here – and next to the busts of the two prototype printers? Well, it was printing that broke the priests’ stranglehold on knowledge. It was printing that brought the Bible – the most important book – to the masses. Wycliffe and Tyndale pioneered the idea of the Bible in English and the John Rylands Library specialises in Bibles, especially the early ones which comprise some of the priceless examples from its collection. But there’s so much more to tell on our John Rylands Library tours – the unlikely union of John and Enriqueta Rylands; the recently discovered William Blake artefacts; the display featuring the oldest existing piece of the New Testament; and the Gothic architecture of the building itself. The tours start with a trip to either the Royal Exchange or St Ann’s Church, and it is at the latter that we meet. The next tours are on Sat 2 Feb, Thu 14 Mar, Fri 12 Apr, Thu 23 May at 11am.